While we’re sitting in the doldrums waiting for the boating season to roll around, let’s see what kinds of activities we can find to entertain us. Ah ha! Found one. And it’s a doozy. 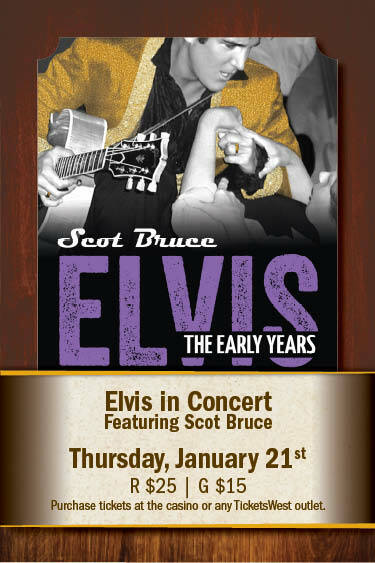 Later this week, Thursday the 21st to be exact, the Coeur d’Alene Casino’s bringing Scot Bruce as Elvis to the stage. Apparently this guy not only looks like the “King” but sounds like him too. He’s even played with the Jordanaires (for those not familiar with them, they’re Elvis’ original backup singers). Plus, Mr. Bruce has appeared in music videos with Faith Hill and Sheryl Crow he currently performs at Disneyland and tours with Legends of Rock & Roll – Buddy, Roy & Elvis. Sounds like he knows how to put on a fun show!